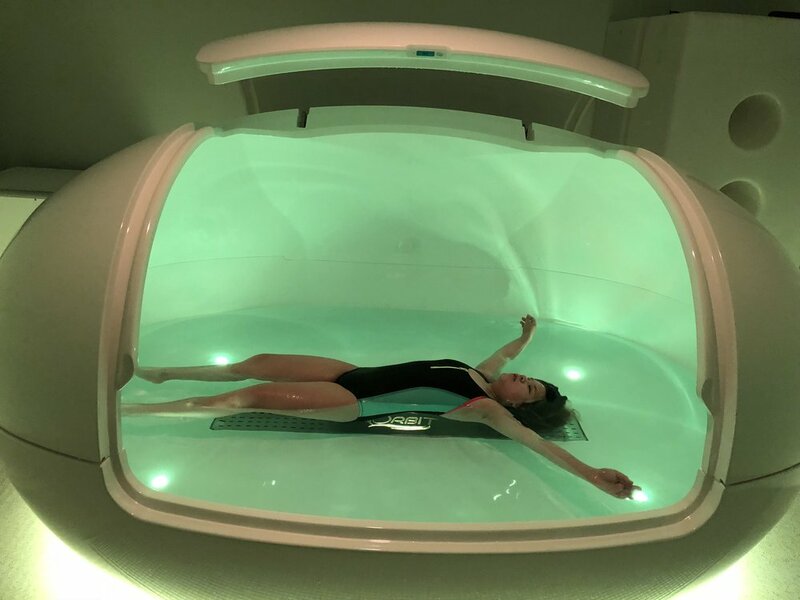 What does it feel like to float inside a pod or tank with about 10 inches of warm water (approximately 93°F) and over 1,000 pounds of Epsom salt (magnesium sulfate)? Not only does it feel simply amazing, it also happens to be one of the best things you can do for your body and mind. Floating has a long history that dates back to 1954. John C. Lilly began experimenting with the mind’s response to sensory deprivation by building a large flotation chamber. He discovered that participants came out of the chamber feeling deeply relaxed and calm. The flotation chamber has undergone several decades of experimentation and modification, bringing us the highly sophisticated pods we see today. To read more on the history of floating click HERE. Float Therapy can lessen muscle tension, pain, jet leg, migraines, arthritis, stress, and even ADHD. It can also increase blood circulation, speed up recovery time after work-outs, and improve sleep disorders. These are only a handful of the many benefits of Float Therapy! To participate, do you need to be a professional swimmer or floater? You have 100% control over your session. You can choose music and lights for your float. If you feel claustrophobic, just open the lid on the pod/tank; however, for a full REST (Restricted Environmental Stimulation Technique/Therapy) experience, you might want to keep it shut. You will rinse off before entering the pod, and take a quick shower when you are done. If you are concerned about cleanliness...don’t worry! They have a very efficient filtering system. Here are a couple of suggestions for your float session. First, I suggest you don’t shave right before your session (the salt may cause a burning sensation). Second, don’t schedule your float session right after dyeing your hair (wait at least a week or until you no longer notice color residue coming from your hair). The closest float place to us here in McKinney is located in Frisco. It is called The Float Spot. Massage Therapists – such as myself – are not as perfect as many people think. We have busy lives just like everyone else. On top of that, we use our bodies a LOT: moving, standing, walking, lifting, pulling, and stepping. All of these movements are necessary for our jobs and they keep us strong, but this also means our bodies often need some extra attention. Self-care for us isn’t a luxury, it is a necessity along with receiving regular massages. I believe self-care is essential for all of us, including kids (they experience stress and have difficulty with pain just like the rest of us). Floating is not the only tool for self-care, but it has been of great value for me. My body and mind love it. Floating gives me mental clarity and makes me feel centered, grounded, and relaxed. Does this sound like something you desire for your life as well? Raise your hand. So, if you haven’t given it a try yet, I suggest you do. Please share your experience with us, or any questions you might have regarding this awesome therapy. To watch a short video about float therapy you can visit THIS LINK.